1/3 10:39PM update: OT baby, and the Chargers move on... AND, no one picked that. 1/4 3:27PM update: Baltimore breaks the streak of upsets and gives some of us our first win of the week... but more importantly, everyone will have at least some points left over for next week. 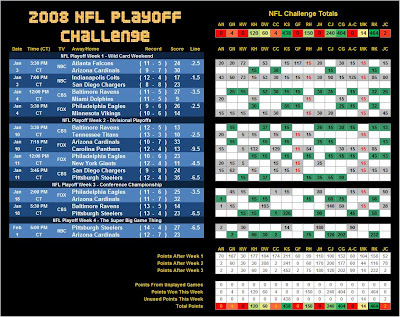 1/4 6:58PM update: McNabb gets it done, and with that, the first NFL playoff week is up. Kevin comes out of it all with the most points... and it looks like Kyle will be getting his room comped. 1/5 1:07PM update: I made some administrative edits to the card. 1/10 6:25PM update: I've got a new drinking game if Baltimore pulls this game out. Anytime a TV personality says "Joe Flacco," you must take a drink. Not just "Flacco," but "Joe Flacco." You won't remember the 4th quarter. Trust me. 1/10 6:40PM update: Look, I'm not the biggest Titan fan out there, but it may be time for them to get off the Kerry Collins bandwagon. Wow, how many underwhelming games does he have to have? If they don't like Vince, or don't think he's ready, they outta think about trading him or drafting someone. On the plus side, we can all try out my Joe Flacco Drinking Game next week! Who is in? 1/10 10:29PM update: Whoa! Panthers -9.5? How about Cardinals -19.5? Is there anyone who wanted that action? It looks like the grocery sacker sent Del home tonight... and bagged a few Pick'em leaders in the process. Kerry Collins looks like Joe Montana now compared to Delhomme's performance. 1/11 9:06AM update: 2day's pickz r up. 1/11 3:19PM update: Dag-McNabb-it... another #1 seed down... another defending Super Bowl Champ disappoints... another favorite fails to cover (5 of 7 playoff 'dogs have won straight up). 1/11 7:12PM update: The Steelers stop the Playoff madness and cover a relatively large NFL Playoff line. Props to Dave and Crystal... each went undefeated this week. Once again, Kevin ends the week on top. It's also time to say goodbye to Amanda, Chris, and Gary. Chris blew his entire 174 pt wad this week (previously 3rd place). But really dude, did you need to win anything else? 1/18 2:10PM update: Week 3 picks are now updated and up. 1/18 2:31PM update: I hope you guys are watering up and getting ready for the Joe Flacco drinking game this evening. If we are lucky, we'll be able to play a Super Bowl version as well. 1/18 4:04PM update: Tips for Philly: 1. Cover #11 (whoops, too late I guess), 2. Get ready for the offseason. This game just got relegated to a small TV in my living room. Time to queue up some 'Without a Trace' and wait around for that Joe Flacco drinking game. 1/18 4:31PM update: Uh oh... watch out Cards, it's the big mo'. This may interfere with my catching up on 'Without a Trace." 1/18: 6:38PM update: Baby bathing duties called, so I'm a little late on updating the final score of the first game AND getting started on the Joe Flacco drinking game. I missed the first series, but I've already caught 2 "Joe Flacco"s. As for the little pickem game we have going on here, Crystal is our leader... at least until the final seconds tick off the clock of this Baltimore/Pittsburgh game. Dave and Crystal will be pulling for the Ravens pretty hard, while Kevin will coast to a huge lead if Pittsburgh covers. 1/18 9:24PM update: First of all, the Joe Flacco drinking game was a huge flop. I only counted 15 Joe Flaccos... that is barely more than a beer if you take 1 oz sips... and there was an entire Joe Flacco drought in the 3rd quarter (only a mention right after half before the clock started). What went wrong? I can think of two big things. 1) Joe Flacco sucked. Most of the time when he wasn't being mentioned, it was because he was handing the ball off or not even on the damn field because he sucked it up the series before. 2) Jim Nance. Most of the Joe Flaccos were uttered by that @ssclown Phil Simms. Jim freakin' Nance screwed up my Joe Flacco drinking game. He's so... whatever. He's a Houston boy, maybe he was tipped off of my game. So I've checked, it was Greg Gumbel and Dan Dierdorf who did the previous Ravens game full of Joe Flaccos......... and now it all makes more sense. It will be a Cardinals/Steelers Super Bowl... not the rousing matchup an all Penn Super Bowl would have been, but I can dig it. Kevin now has 2 weeks to figure out his Final Jeapardy-style play for the Super Bowl. He's got a big lead, but he'll have to win the pick (or pick the same winner as Rich) to pull off the win. 1/27 9:42AM update: Super Big Game card sent. 2/1 4:30PM update: Super picks are up... and we have a contest folks. If Pittsburgh covers, Kevin wins. If they don't, Rich wins. 2/1 9:12PM update: Pittsburgh wins 27-23! And... Rich wins!